I received this novel from Net Galley and Hodder and Stoughton in return for an honest review. I had heard a lot of great things about this novel online since its publication in 2017, and since there is now a sequel to read too, I really felt that I should pick it up! I will admit that this is not the type of book I would normally read, I don't read a lot of contemporary novels, especially contemporary YA, but I watched To All The Boys I Loved Before on Netflix, and I was really in the mood for something light and adorable. This novel is cute, like CUTE cute. The characters are adorable, the way they act is adorable, the whole novel has this warm glow. It was really easy to read, and a perfect pick-me-up read if you require one. The main characters are instantly likeable, and their chemistry and banter is very sweet and entertaining to read. I loved Dimple, she was smart and sassy, and although I did get a bit irritated by her on occasions, overall she was a great character. I felt basically the same way about Rishi. A bit irritating but in general sweet and likeable. In the beginning I wasn't that keen on him, but as we learnt more about him and why he acted the way he did, I really grew to like him a lot. Their relationship is near perfect. They compliment each other so well, and it's a joy to read about them. I also really liked the setting of this novel, any YA novel set at University/college is a plus for me, if you can recommend any good ones please let me know in the comments?? I also liked the coding/app development aspect of the novel, it was something very different in YA, it was nice to read a book celebrating braininess. It was also important for me that the characters were POC. I can't comment on how accurate the depictions were but I'm constantly striving to read more diverse reads, and this one is a good one. Overall I really enjoyed this novel. 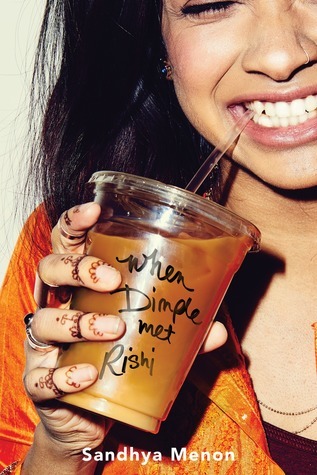 I gave it 4/5 stars, and if you're looking for a sweet diverse YA contemporary read, this one is perfect to pick up. Have you read When Dimple Met Rishi? Did you enjoy it? Let me know!